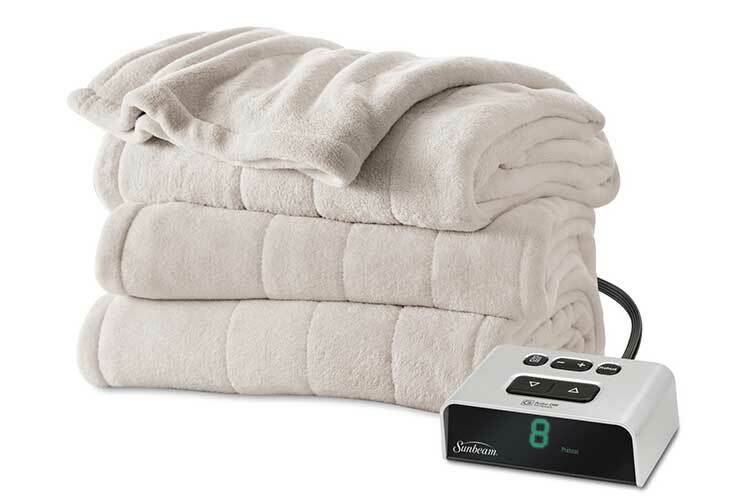 Best Electric Blankets 2018 - Warm and Cozy All Year Long! Winter can be brutal sometimes, and we need all the help we can get to keep warm and cozy during those months. Well, I have been using electric blankets for years as a part of my arsenal against the biting cold – I don’t know what I would do without the warm cozy feeling they provide. Apart from feeling great, they can also help you to save on your energy bill because instead of turning up the thermostat sky high when it gets cold, a good electric blanket will keep you warm enough so that you don’t have to turn the thermostat way up. I’ve put together a list of my top 20 blankets and throws and if you look you will see that there are a few surprises in there as well! Welcome and I hope you enjoy my best picks. 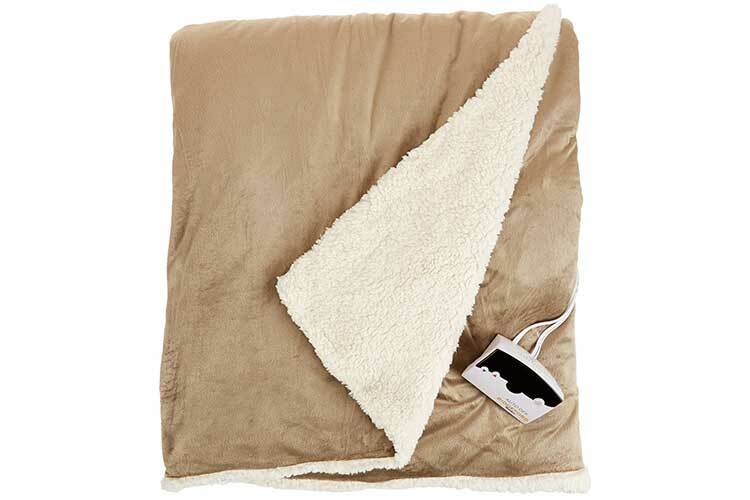 Sunbeam’s micro plush heated blanket is like sleeping with a little piece of heaven. It warms up your bed during the cold nights of winter and with its ten heat settings, it will be impossible for you not to find the perfect temperature for you. Many people shy away from heated blankets because of the perceived safety issue. You need not be concerned with this blanket because it has an auto shut off feature, so if you do forget to shut it off, it will do so after 10 hours. The larger sizes of the blanket, queen and king, come with two controllers so two persons can set their own level of comfort. Many of us know how unpleasant it is to retire to bed with the sheets being cold – you have to talk yourself into getting into bed. Sunbeam allows you to transition comfortably by including a pre-heat feature that allows you to warm the sheets before getting in. This goes a far way in making the entire experience with the Sunbeam blanket warm and comfortable. In addition to the warmth that this blanket provides, it’s made of ultra-soft microfiber, which is super comfortable. Many manufacturers claim that they are providing you with the best quality microfiber, only to leave you disappointed when you actually get the blanket in hand and find it to be substandard. This one will not disappoint. Biddeford’s micro plus Sherpa is a high quality product. You will know this just by looking at it; you can see the quality of the material and workmanship. Sometimes an electric blanket will stick out like a sore thumb on your bed, as they don’t blend in seamlessly with your bedding. This one, though, because of its good quality, looks great on the bed. 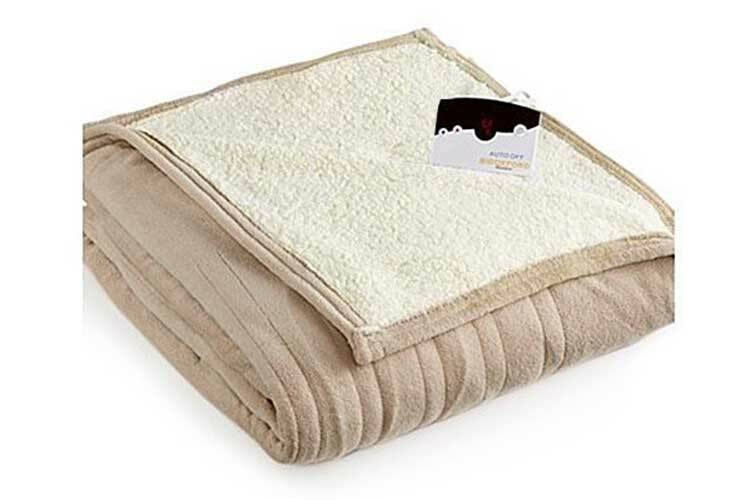 It’s designed with mirco plush on top and Sherpa on the bottom and it’s lightweight, not bulky as these blankets sometimes are, yet it keeps you very comfortable and cozy on cool nights. In fact, many reviews say that it’s so warm on its own it’s sometimes not necessary to use the heat feature. The blanket will warm up fairly quickly and maintains its temperature once selected. As temperature conditions change, you may need to either turn the settings up or down. 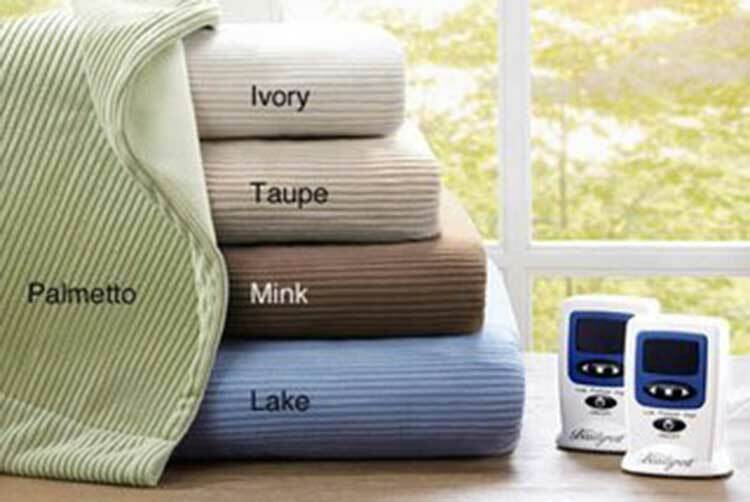 This blanket has 10 settings to choose form, so you will be able to select just the right temperature to keep you cozy. 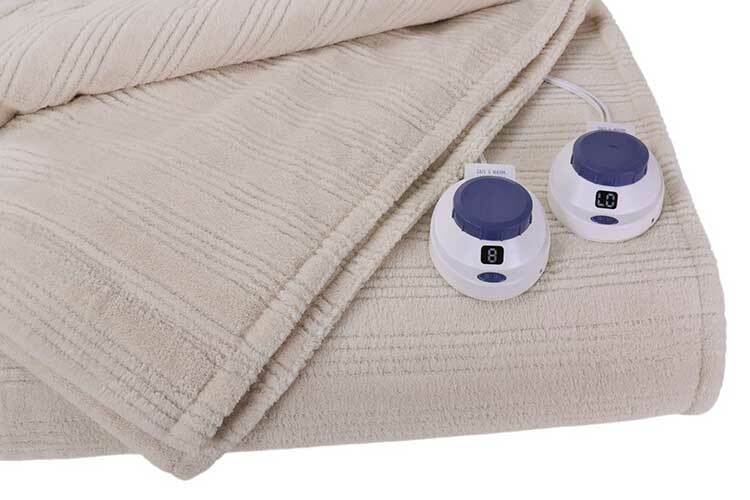 The controls are very easy to use and the blanket has an auto-off feature, where it shuts off after a few hours. If you want to ensure that you have warmth all night, we recommend that you shut off the heater and turn it on again just before going to sleep, that way it is unlikely that it will shut off before you get up in the morning. The Holmes Sunbeam will first get your attention because of how it feels. Its soft texture is one of the best out there as it is rated as premium soft, and it feels like a dream. You are guaranteed to spend cozy nights under this blanket and, coupled with the primary reason you would purchase it – as a heated blanket – we don’t think that having tried this one you would want to try any other. One if its best features is that it has the ThermoFine warming system that senses temperatures and adjusts automatically. The benefit here is that as the night gets colder you will not have to get up to adjust the temperatures. In fact, you probably won’t wake up at all because you will be resting in comfort as the temperature automatically adjusts around you. Blankets will need to be cleaned after a while and you may be concerned that you will not be able to clean a heated blanket. Don’t be concerned, as the Holmes Sunbeam can be washed and dried either manually or in the machine. You just need to ensure that you remove the power cords and controls prior to placing it in water, and be sure to handle it gently. When I did research on this blanket I was so eager to try it because it’s a little different from the standard heating blanket. 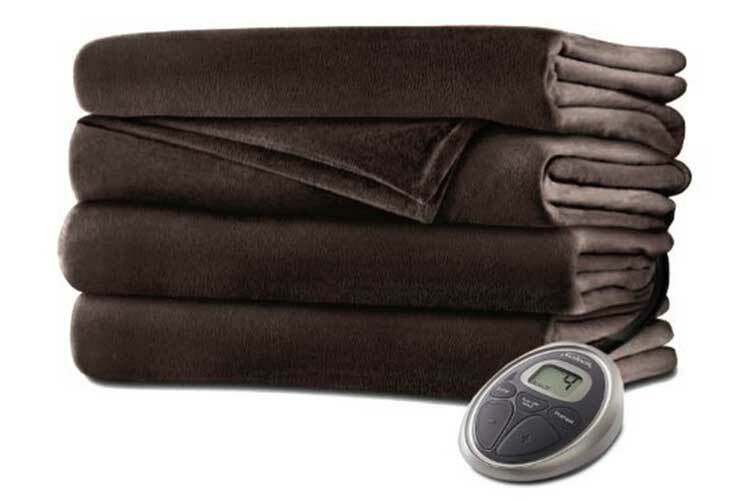 Soft Heat’s Luxury Micro-Fleece is low voltage so it is said to be non-hazardous when compared to the average heated blanket. How it works is that it comes with a box that converts the AC current from your regular power supply into low voltage DC current; this is similar to a battery’s power, and this is why it’s safer. The other benefit here is that it uses less electricity this way so it’s a more cost-effective heated blanket as well. The thought that it’s safer and uses less energy is a huge selling point, but there are other features to love. Some blankets will have heating wires that do not cover the entire blanket but only some areas and, in most cases, the wires are space five inches apart. Soft Heat’s blankets have their heating wires spaced three inches apart so it will be more effective in keeping you warm. They also cover the entire blanket with wires so you are guaranteed heating from end to end. The wires though are also ultra-thin, so you will not get a bulky or “wiry” feel. When you touch the blanket after it has been turned on for a few minutes, you might be surprised to find that it is not hot to the touch; you will have to snuggle under it to feel the heat. It also has an automatic shut off feature and a variety of temperature settings. For some of us, it can be difficult to find that “sweet spot” when it comes to selecting the level of heat that you need to keep you comfortable. The differences between settings can feel like too much or too little change from one setting to the next, so you either get too much heat or not enough. With Sunbeam’s Velvet Plush with 20 Heat Settings, you are unlikely to ever have that problem. Sunbeam ensures that you are comfortable as the multiple settings will satisfy everyone. One of the benefits of having a heated blanket is that it provides targeted heating, by heating exactly where you need to be warmer at night. Most people turn up their thermostats at night to make their space warmer and more comfortable for sleep. 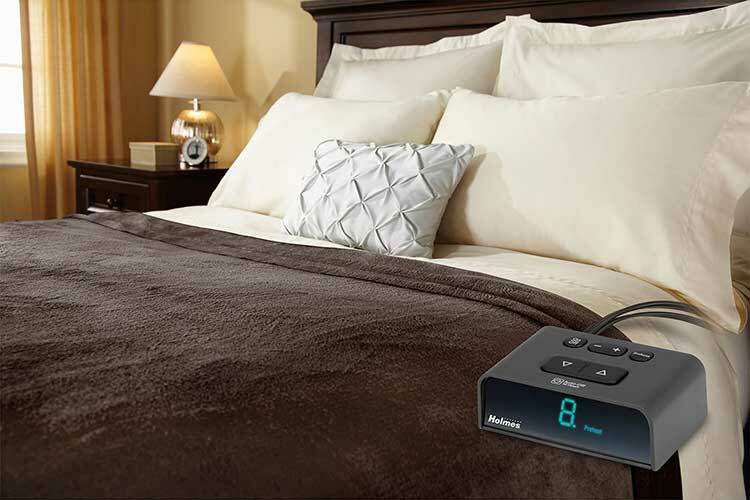 By using Sunbeam’s heated blanket, you can turn down that thermostat and save on energy costs because your bed will be warm – exactly where you need the heat. 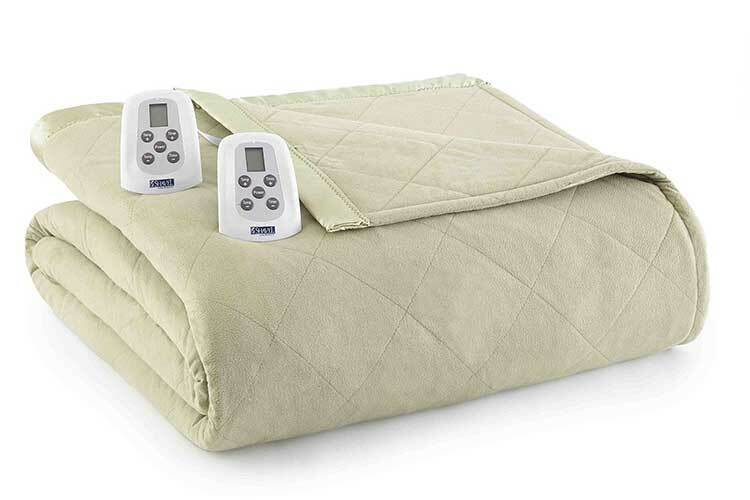 This blanket has dual controls, so there will be no bedroom wars since each party can select the temperature that is most comfortable for them. The controls also fit nicely in the hand and are easy to operate, which is what you need when you are half asleep and may want to change the settings a bit. This blanket from Biddeford is a winner simply on the warmth and comfort provided. It has two types of fabric, mink and Sherpa, and the combination gives you total comfort. It’s a very warm blanket on its own and when you turn on the heat feature, it’s just great for the cold winters we’ve been having. Nothing is worse than getting under a blanket and expecting to be wrapped in ultimate comfort, but instead, feeling as though you were wrapped in a roll of wire. Many blankets out there are very uncomfortable because they use bulky wiring, which is easily felt through the blanket and is very uncomfortable and distracting. 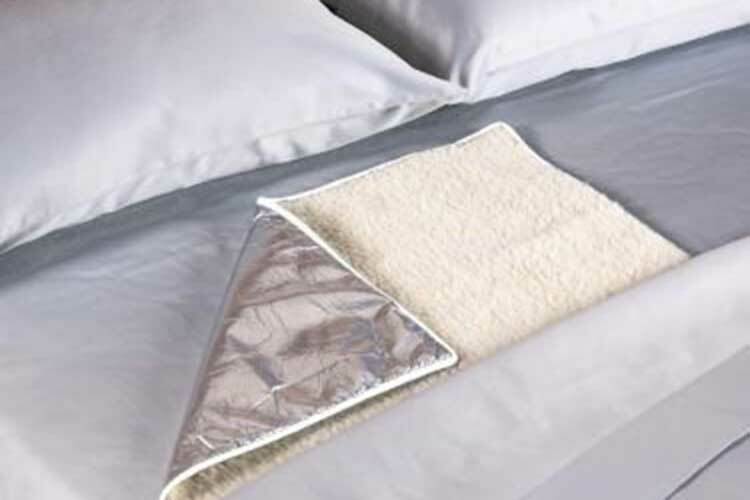 Biddeford Micro Mink and Sherpa uses ultra-thin heating wires, which are much smaller than those used in the average blanket, so you won’t feel them; you will enjoy the comfort of the Sherpa without thinking of anything else but getting a restful night’s sleep. This blanket can be machine washed and dried and it will not affect the overall performance of the product. What we appreciate though is even with the washing, it does not pill or get that stiff feeling, as so many others do. It maintains its plush softness after being washed. For many of us, it’s really hard to keep our feet war, and not just in the winter. We will be under a nice warm blanket and everywhere is fine except our feet, even when wearing socks. Instead of trying to warm your feet on your partner, you should invest in Sunbeam’s Heated Comfy Toes Foot Warming Pad. This pad is placed on the mattress under the fitted sheet and when you use it for the first time, you will know that there is no turning back for you. There are three temperature settings on this heating pad. They get the job done in keeping your feet warm and reviewers report that it does not get too warm, so it doesn’t bother the other person in the bed who does not have a problem with cold feet. Some reviewers report an added benefit of the heating pad’s warming their calves, which they liked. Sometimes cold feet are merely a symptom of a deeper problem. There could be some problems with the nerves or with circulation. 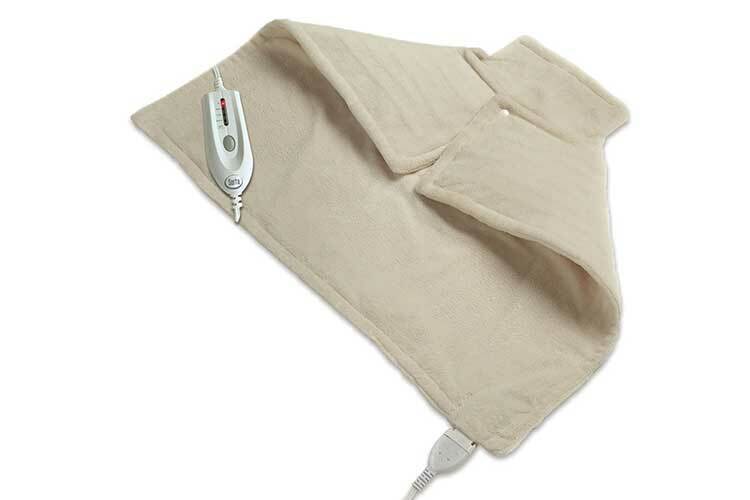 Whatever the cause of cold feet, this heating pad is ideal for those who need relief from these conditions and so the pad need not only be used at bedtime, but at any time when it will provide a soothing effect for the user. Soft Heat has done it again by delivering a high quality blanket that will guarantee you warm and comfortable nights and, at the same time, using its energy-saving technology to save you money. We continue to be intrigued by the cool to the touch but very warm blanket when it’s in use. If you’ve used heated blankets before, you will know that one of the cons is that they sometimes tend to slide out of place or off the bed completely, which defeats the whole purpose of getting a blanket to keep you toasty all night. This one features a ribbed finish which helps it stay in place, minimizing the chance of it slipping off during sleep. The blanket is also made with an additional fiber fill layer which is what helps to give it a heavenly feel. Added to this, they say that each heating wire is wrapped in a layer of fiberfill to direct heat down towards you, which helps with even heating and making sure that the heat is long lasting. If each wire is wrapped, its no wonder that you do not feel the wires in the blanket. The controller is a knob that is easily grasped and turned. 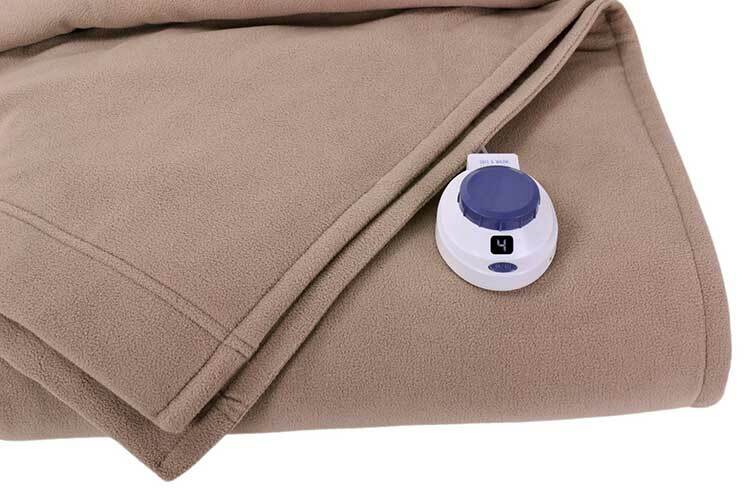 This comes in handy in the middle when you just need to turn the temperature up or down, and don’t want to have to be feeling for buttons to push, which is how many of the controls for other blankets are designed. There are some of us that, despite the years of research that have gone into developing heated blankets and their record of safety, will never ever try one because they are wary of going to sleep on top of or under an electrical device. If this is you, you need not suffer through another cold winter, you should consider trying the Upgraded Instant Heat Blanket. This heater has no wires, no controls, and no electrical elements to worry about. It’s made using Mylar reflective backing, which kinds of look like tin foil. The backing is attached to a regular blanket. All you need to do is to put this under the fitted sheet or use it as a blanket and snuggle under it. Your natural body heat is the heat source and it’s reflected off the Mylar and back to you, keeping you toasty at night. You don’t have to be concerned about turning it off because its non-electrical and you can even use it in the kids room with the confidence that they will be safe. The size and ease of use for this blanket makes it great to use in just about any setting in the home. You can place it anywhere that you are going to sit or rest. You can use it in the living room while watching TV, in the dining room, or literally anywhere that you choose to take it. Serta is a well-known and trusted brand that you can count on to provide you with high quality products. Their Luxe Plush has all the elements of quality that you would expect from Serta. They use the best micro fleece and put in an extra layer of filling to give you a feeling of ultimate comfort and luxury. No one likes getting into a cold bed. The pre-heat and hold feature of this blanket allows you to warm the bed to your desired temperature and keep it at that temperature until you are ready for bed. You have 10 temperature settings to choose from to make sure that you get maximum comfort, and because of how its made you are guaranteed that the whole blanket will heat up, and not just some sections of it. While many brands make their blankets with an auto shutoff feature for safety reasons, lots of people do lot like the feature as it can leave them cold in the middle of the night when the controls shut off on their own. Serta takes care of this concern by making their blanket with a manual shutoff. That way you get to control when the blanket goes off and you will not wake up in the middle of the night because you are cold. The first thing that you will notice about this blanket is how well made it is. It is in a league of its own; you see a quilted blanket made of the finest micro fleece and trimmed with satin, so right off the bat you know you are miles ahead of the usual heated blanket that can sometimes look and feel like a ball of wires in a sack. But the quality is so much more than what you see with the naked eye. Inside of the blanket is where Shavel Home really gets to work. They use a very soft wire and these wires are encased between two layers of electrical dampening cloth. This is then wrapped in two layers of down alternative and then the “magic” micro fleece is added. The result of this is one of the most comfortable blankets you will ever use. With many blankets, while they work just fine using them can be a pain because of the short cords; its difficult to plug them in if your bed is not right next to an outlet and if you do manage to plug it in, it slips easily from the bed because the power cord is pulling it away. Shavel provides 16 foot cords so there’s hardly a bedroom where the power cord will be a problem. The Shavel Home Products Thermee comes in Twin, Full, Queen and King, but with a relatively low number of 8 secure heat stings. In a space where 10 heat settings have become the norm, this is a statement that they are extremely confident in what they have to offer and that their 8 settings will work as well as or even surpass the 10 settings of others. 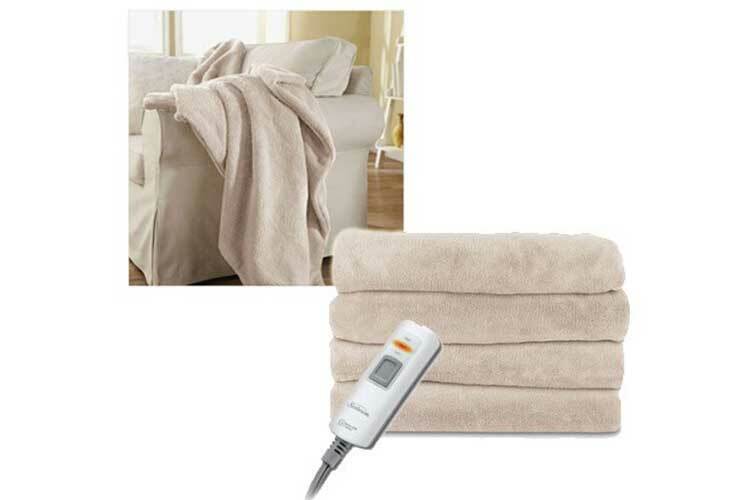 Soft Heat’s luxury Micro Fleece in the twin size is a nice buy for a small room or space. The kids will love its soft and comfortable feel while you will feel comfortable with them using this low voltage blanket that provides steady heat, safely. Because of its design it is unlikely to overheat, and with the 10 setting thermostat you are sure to find the temperature that will make your child comfortable during the night. We recommend that you do not allow your child to adjust the blanket’s heat setting on their own, just to add that extra layer of safety. Like adults, most kids don’t like heated blankets where you can feel the wires. With this plush micro fleece blanket, the wires are wrapped in an extra layer of fiber fill that, along with the other layers, cause you not to feel the wires. You can feel comfortable with leaving them with this blanket at its low voltage, so there is less risk of fire. 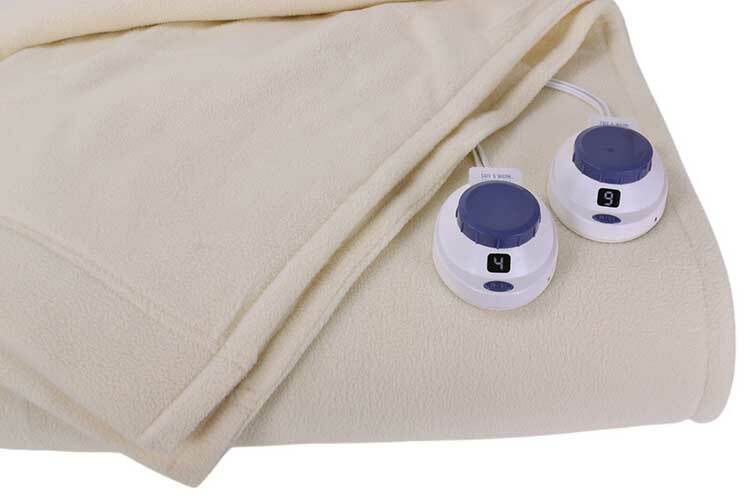 A low voltage electric blanket uses DC energy that is less dangerous, and the wires are smaller. It heats up using less than 25 volts, but, believe us, this is enough to keep your child warm at night. If you love the feel of an electric blanket or throw while in bed or otherwise reclining, you know the feeling of being ripped away from your cocoon of comfort when you need to get up or move away from the blanket or throw. 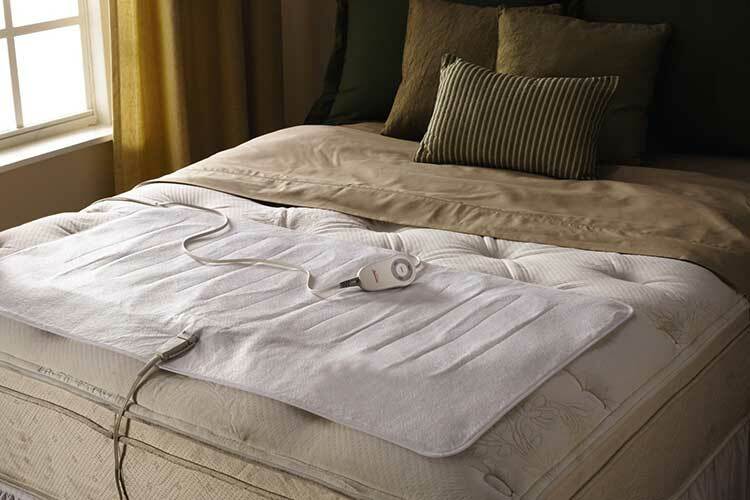 Well, the team at Serta has provided us a with a solution to this problem – the Cuddler Electric Heated Wrap. 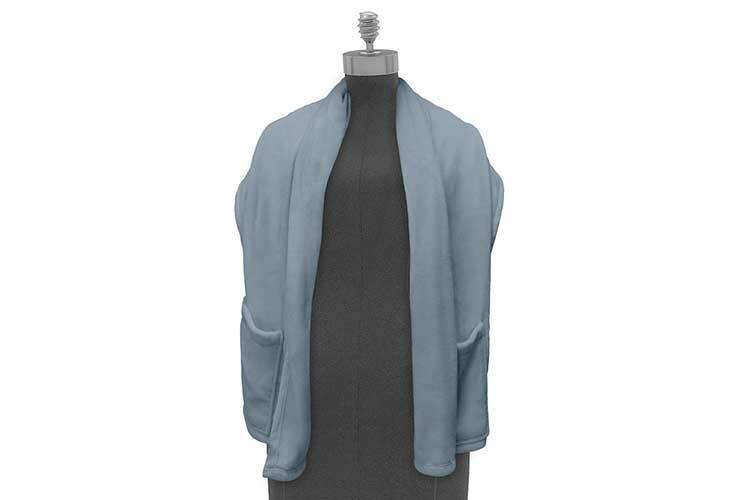 This is a like a throw or shawl with sleeves and pockets that allow you to wear it like an item of clothing. The versatility of this product is endless. You can move around the home without losing the lovely warmth provided by the wrap; it can go anywhere there is an electrical outlet. You can use it as you watch TV, work at a desk, or nurse a baby! There are so many ways in which this wrap can be used. Many reviewers report that they use this in their offices where they can’t adjust the temperature to suit them. They simply plug in at their desk and it’s possible that their productivity improves as they are not worrying about how cold they are. Another great way to use the wrap is for the therapeutic benefit of heat. If you are suffering from a stiff neck or back, this is an ideal way to provide soothing relief for these conditions or for any other type of condition that benefits form heat therapy, and you don’t have to be lying in bed to do so. The beauty of heated throws is that they are made with relaxing in couch or chair in mind; they are compact when compared to a heated blanket, and easily moved from room to room. While they are perfect for use with chairs and couches, they can also be used in bed, so you can get quite a bit of function from a throw. The LofTec 2 two person throw by Sunbeam is a great choice if you are looking for a throw. Snuggling up under a throw is great alone, but even better if you have company. This throw is huge and easily accommodates two persons with full coverage, meaning your feet are not left sticking out from under the throw because it’s too short. It also comes in a variety of colors to choose from; you are sure to find a color or shade that blends or contrasts with your decor, depending on the look you want to achieve. This throw has three heat settings, so you are sure to find a setting that’s just right for you. It also comes with a 3 hour auto shut off feature as sometimes you may forget to turn off the heater when you get up. We know you will love this product and will use it a lot, which means it will have to be cleaned. The throw is machine washable and dryer safe so keeping it fresh and clean will not be a problem. Sometimes we use a product, not because it’s exactly what we need, but because we are not aware of some of the options that are out there. You may not need warmth for the entire body like with a heated blanket or throw, but prefer to target a particular area. If your neck and back are the areas that you want to keep warm, you should consider getting the WellRest Therapeutic Neck and Back Warmer. If you sit at a desk for very long hours each day, this product will go a far way in not only keeping you warm, but also keeping your muscles loose and comfortable; you are less likely to develop a stiff neck or back when using it. It has a snap fastener, so it won’t slip off your shoulders while you are seated. For others who might require heat therapy for these areas for medical reasons, this neck and back warmer is ideal for providing soothing heat therapy. If you are one of those persons who only need their neck and back to be heated to sleep comfortably in cooler temperatures, you can lie in bed and place it over your shoulders and neck, and drift off to sleep as the warmer does its work. This product has four temperature settings for you to choose from, and reviewers have said that these settings are more than adequate in providing the heat that you need. It also comes with a long cord to give you flexibility of movement, and it has an auto shut off feature as well. 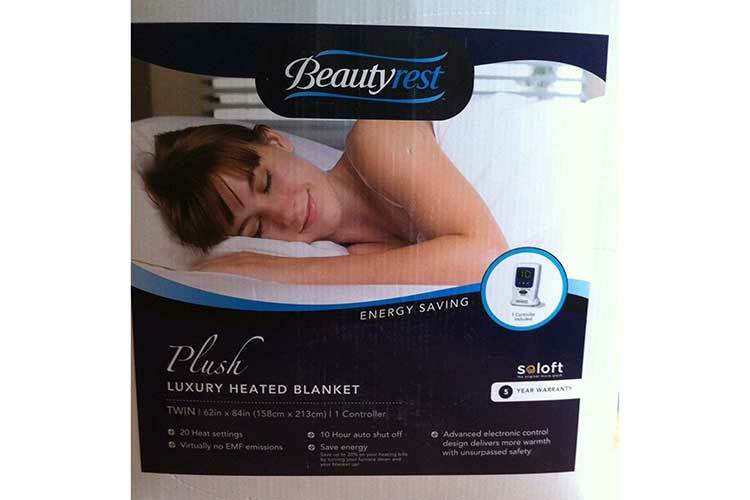 Beautyrest is a company that has been around for a long time and they are known to provide high quality products. 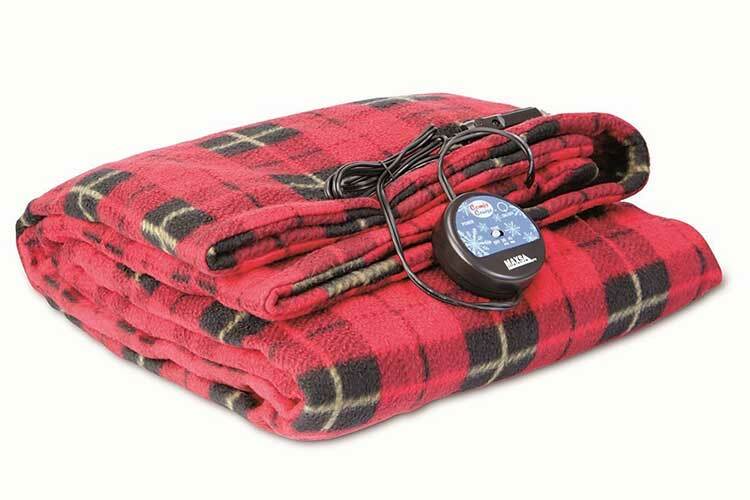 Their ribbed microfleece heated blanket carries on this tradition, as it is a well made blanket that provides all the heat you will ever need during the cold winter months. You will love the ribbed design on this blanket – it’s a nice change from the usual design and adds an element of interest to the room. It is available in a range of colors that are sure to match any room decor. It’s made of high quality textured microfleece, so you know it’s extremely comfortable. One of the concerns for electric blanket owners is that because the cords are sometimes inflexible, it causes premature wear and, inevitably, the blanket stops working. The Beautyrest comes with flexible wires which minimizes the chance of cord damage. It has 20 temperature control settings so everyone will be able to have their perfect temperature setting, and it has the standard safety feature of automatic shut off as well. 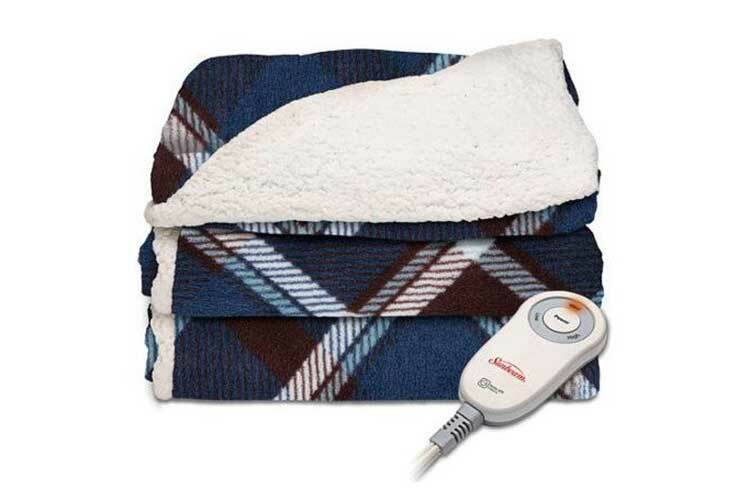 We know how easy it is to become attached to your electric blanket or throw during the winter. It’s hard to leave the warm comfort that they provide to get out and about. Well, courtesy of Maxsa Innovations Comfy Cruise, you can take that comfort with you on the road as they have a heated travel blanket that can be used in the car. Awesome!! Even though your car has a heater, this blanket is great for people who still need an extra layer of warmth, or in situations where you don’t want to turn the heater on, but some passengers like children or older people need to be kept warm. The blanket is made of polyester fleece, a fabric which is excellent at holding heat and designed for extreme cold conditions. It’s large enough to cover two people and with its seven foot cord, even persons traveling in the back of a large vehicle will be able to use it. The blanket is plugged into your cigarette lighter or 12V outlet. The vehicle does not have to be running for the blanket to heat up, and it uses only 48 watts for power. To be on the safe side, I would recommend that you use the blanket while the engine is running to avoid any potential problems. It has an auto shut off at 30 or 45 minutes, and it has a pre-set heat level, which reviewers say is more than adequate heating for the car. 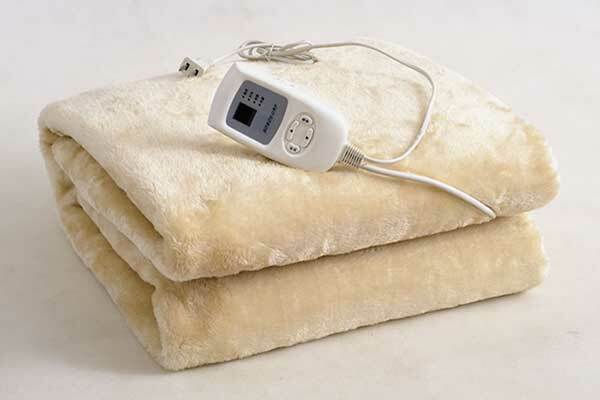 If you need a king sized electric blanket, Shavel Home Products Thermee would be a good choice. Its superior quality makes it look great and with touches like a satin finish at the top and bottom of the blanket, it will make you feel like royalty when you are using it. It’s made using a micro flannel fabric which wears well, so it won’t pill or shrink after being used for a while or after laundering. It’s also wrinkle resistant so even though you may have been using it for a while, it doesn’t get that worn out look because of wrinkles. What I loved about it is was that it didn’t slip from the bed easily or slip off during sleep, and I toss and turn a lot! I think it’s due to the quilted design and the type of fabric used. It’s super soft to the touch but yet won’t slide around on the bed. This blanket is very light and easy to use, not bulky like some others. I was surprised to find that even though it was so light it had seven layers, which is what makes it feel so awesome. A blanket this big will have at least two people using it at the same time. Everyone has a different heat tolerance level and it’s great that each person can customize the heat to suit their individual needs. With 8 heat settings, it’s enough to provide you with the temperature you need to keep warm all night. Sunbeam’s Electric Reversible throw offers you superior warmth with the flexibility of using the throw in a variety of settings. I don’t know if it’s the premium Sherpa of this throw, but once I wrapped myself in this blanket, it was like heaven on earth. It is so incredibly warm and inviting that you just do not want to leave its warm embrace. It incorporates Sunbeam’s Theromofine technology, which senses where the temperature may have dropped and sends heat to that area to restore heat to the preset temperature. That’s a great feature as it ensures that the heat is evenly distributed at all times, making using this throw an enjoyable experience. The throw is reversible so it offers two decor options and it comes in four great designs. It’s well made so it does not unravel, and the hems and the Sherpa do not shed or pill. It has the standard three temperature settings for throws and also features a three hour automatic shut off. It’s not big enough to fit two adults comfortably, so know that everyone will be vying for first dibs with it, but that’s all the motivation you need to pick up another of this great product. It’s competitively priced so getting another one or two will not be too difficult. 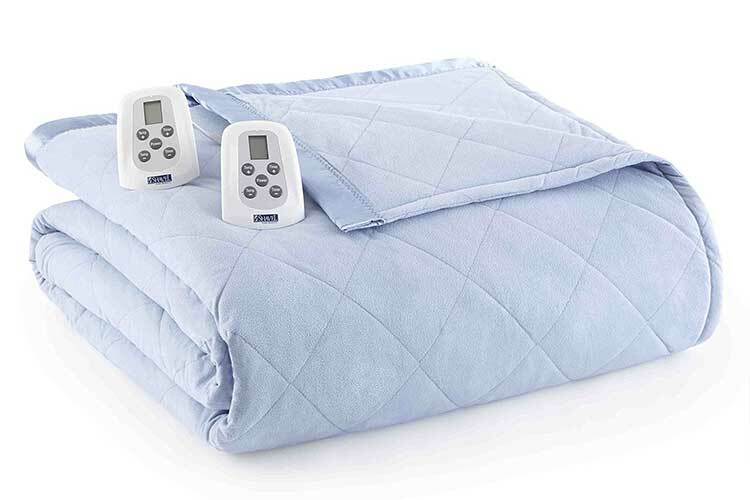 This twin sized blanket from Beautyrest allows you to enjoy the lovely soft and luxurious feeling of a top quality blanket with the heating factor added to make it feel out of this world comfortable. It’s made of polyester and micro raschel which makes it easy to maintain and provides the softness that makes it feel so comfortable. 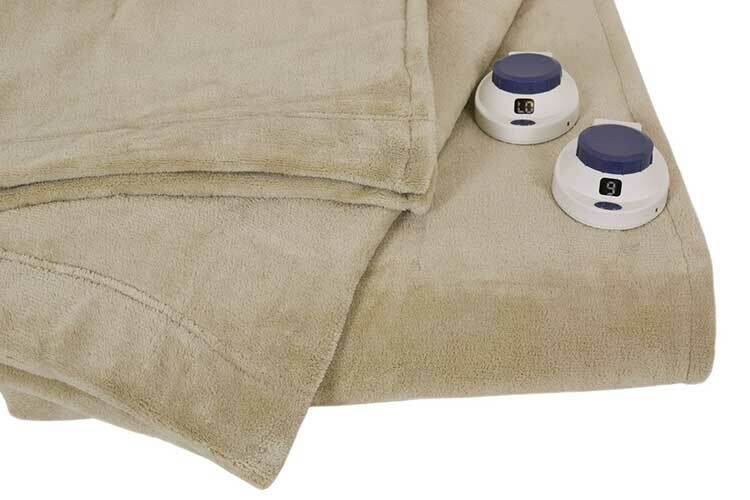 The blanket features a LED control which stands upright on the nightstand, like a clock or radio, and it’s easy to see and operate at night, so if you need to make a temperature adjustment you don’t have to spend what seems like an age doing so. It has a flexible cord which makes the blanket easier to handle and wrap around you if you so desire. It comes in a whopping 15 colors so you know even the most discerning customer will find the color to suit their needs. Another great thing about it is that it heats up pretty quickly once it’s been turned on. It has 20 heat settings, giving you a lot of flexibility to adjust the temperature to suit your needs. When the temperatures start to drop don’t allow yourself to be needlessly uncomfortable because of the cold. This selection of products is a good place to start in finding the electric blanket or throw that is just right for you. For the veteran blanket users like me, I hope I was able to show you some new products and alternative heating solutions. Remember too that apart from keeping you warm and cozy, heated blankets will help you to save hundreds of dollars on in heating costs as you do not have to turn the thermostat all the way up to keep warm. Here’s to warm days and even warmer nights!